As I continued doing searches for keywords on ProQuest Dissertations, I ran searches of dozen black women writers, including novelists, poets, and scholars. I was curious about how many times those figures were mentioned in dissertations from 2000 - 2018. 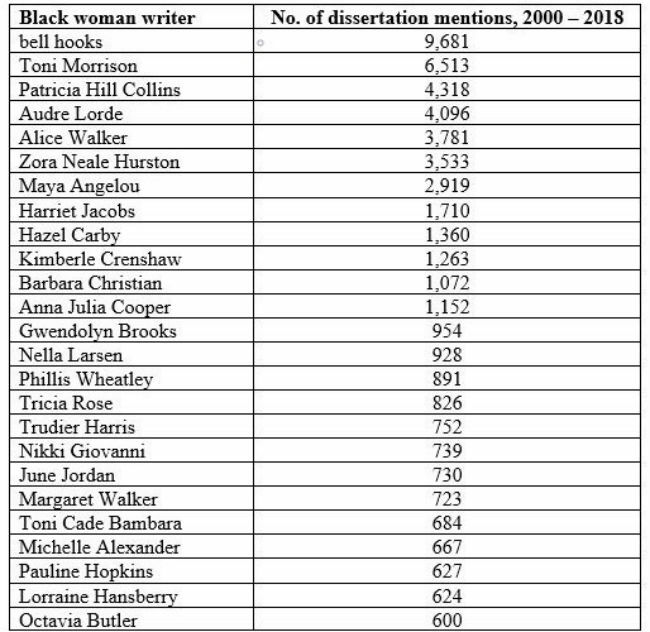 Of the many black women writers I produced queries for, here's a look at a ranking of mentions and the top 25. I was intrigued that 7 scholars -- bell hooks, Patricia Hill Collins, Hazel Carby, Kimberle Crenshaw, Barbara Christian, Trudier Harris, and Michelle Alexander -- made the list. I understand why bell hooks appears more than Toni Morrison, but somehow I had not initially thought of her when I considered mentions. Seeing that she was the most frequently referenced figure led me on the searches concerning those other scholars. It's worth noting that ProQuest is only tracking mentions and not necessarily how much the writers are discussed. I imagine, for instance, that dissertation authors mention various writers only in passing, while devoting far more concentrated and expanded attention to others. As subjects, black women writers coincides with the field of African American literary studies witnessing large growth during the late 1990s.